Sarah Gee, fundraising consultant and Marcia Springer, Senior Communications Officer receive a cheque from The People's Postcode Lottery Cultural Trust. We are proud that mac birmingham is one of 696 arts organisations to be included in Arts Council England’s funding portfolio, playing a strategic role in delivering great art for everyone. ACE’s support is confirmed currently until March 2018. Birmingham City Council has invested in mac birmingham since its inception. 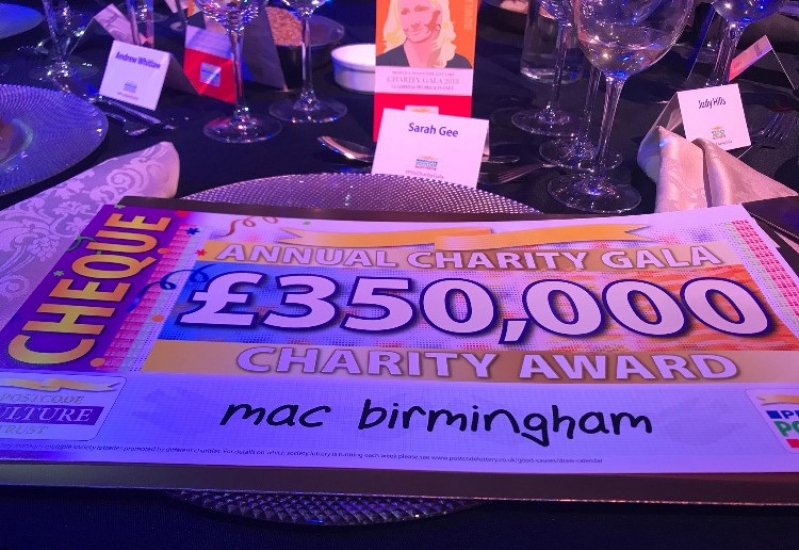 mac provides a range of services and programmes for the Council both at our Cannon Hill Park venue and through our Outreach activities across the city and especially in Hall Green District where mac is 'Arts Champion'. Since 2014, we have been fortunate to receive support from the People’s Postcode Lottery Cultural Trust, a charity funded entirely by players of People’s Postcode Lottery. Their generous investment of £350,000 this year enables MAC to welcome over 1.2m people through our doors each year, supports art and artists, and provides a free programme of events for our audiences.